Cloudfogger encrypts your data on the local device before it gets uploaded to the cloud. That guarantees that Dropbox and others never get access to the content of your files. Cloudfogger uses transparent encryption, which makes daily use fast and simple: On the local system you still access your data as you always did - while all files are securely encrypted when they get uploaded to the cloud. 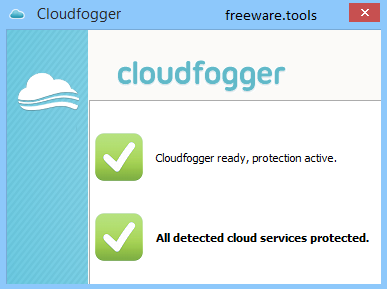 Cloudfogger-protected files can also be shared without sacrificing security. You can for example use your shared Dropbox folders securely together with others. Since the Internet is one of the most commonly used methods of file sharing nowadays and most computers have an active connection, important documents need to be kept protected. There are various specialized applications that can aid in this regard, with Cloudfogger being one of them, encrypting files so that only you have access to them. One thing that needs to be mentioned before going on with more technical details is that Cloudfogger is not strictly dedicated to what the name tricks you into believing, namely protecting your cloud space, the application being usable on any kind of environment. With an intuitive design and guided configuration before the first run, you quickly get the hang of it. Target folders need to be chosen, with an additional option to select users that can access encrypted files. This is done by sending an email to the target sharing partner, but the application must be deployed on each machine. The amount of effort required on your behalf is close to minimum, with the application almost instantly handling files stored in the target folders. A context menu entry is created that allows you to quickly “fog” any file or folder. What's more, simply copying files to the protected folder automatically encrypts them. Moving files around, mostly while the application is not running, either leaves files vulnerable or makes them completely inaccessible, with the application unable to do anything in this regard. What's more, there is no strict connection to your cloud space. In order to keep files encrypted this way you simply need to choose a folder from your virtual storage space. In order for everything to flawlessly function, the application must be running at all times. On an ending note, Cloudfogger is basically an encryption method with a fancy presentation to trick you into thinking it's dedicated to cloud usage. However, only one encryption algorithm is used, with no customization options, nor the possibility to provide an additional password. Attention is required on your behalf so you don't lose important content.